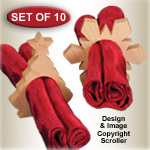 Create our crafty little Napkin Rings for use this Spring holiday seaon. Dress up the kid table & be sure and make plenty; everyone is going to want one to take home!! Made using 1/2" hardwood of your choice. Leave natural and coat with a sealer or add your favorite stain or holiday paint color. (Approx. 4" tall).